There are readers (and book-writing gurus) who want the first few words of the story to grab them so hard that they can’t let go until the end. I thought I felt a little this way too, so I started to pay attention to the first sentences of the books I read. Strangely, most were quite plain. It took time to get into the story, to fall in love with it. Some books, which I absolutely adore, required my attention for at least the first few chapters before love blossomed. That felt contrary to every writing advice I’ve read. But I did notice that while falling in love with the story might take a bit of time, strong dislike can be achieved in just a few sentences! We might relate to stories the way we relate to people. There is a ton of research that points to the human ability to judge one another — we can tell if the teacher is any good in the first 30 seconds! And our opinions don’t change, staying quite stable after an hour, a day, a week, and even after a year’s worth of instruction. That’s an evolutionary advantage — it’s good to know who is your enemy, whom you should avoid, and who potentially could become a good friend. We call this “chemistry.” Perhaps stories are just like that — you can get turned off real fast, even as falling in love takes a bit of time. I assume people who subscribe to my newsletters or read my blog have read most of my stories. We have “chemistry”! I buy books on “chemistry” that I feel for my favorite authors. I find a writer I like and I read everything they have ever written. In a world of entertainment uncertainty, it’s a sure bet. So I’ve crawled through my stories and gathered a few beginning. If you like (and haven’t read) some of these, then you can find them on my blog, just search for the name or click on the name of the story. If you can’t find something, then you just discovered a tiny preview of an upcoming book or a short story.y. “Becoming Animals”: He could smell food. Where? The scent overlaid the environment like a map. “Coding Peter”: The man was dragging the boy by his ear, practically lifting him off the ground. The boy made whimpering sounds but didn’t scream. “Pigeon”: On the day his mother died, Pigeon learned he could fly. “Suddenly, Paris”: The phone rang again, and the vibration sent it skidding even farther down the muddy slope. It hit a branch and snapped open. “Twin Time”: “Alex?” “Dad?” There was noise on the line. Alex heard the sirens of emergency vehicles. She had a sick feeling, making her hand tremble as she jammed the cell phone harder against her ear. “Baby Killers”: Brian was running away. He dumped his laundry basket into the trunk of his car, wrapped his computer in a towel and stuffed it underneath the mixture of dirty and clean clothes, and took off North. “Lizard Girl and Ghost”: So that’s me–lying here in some secret facility in a glass coffin with tubes and kabelsalat sticking out of me. “God of Small Affairs”: John sat across from Ay-Tal in a small but private train cabin. She was almost thirty years his senior but still very beautiful…at least he thought so. “Harvest”: “The exton controls are not responding!” Marc shouted into his exoskeleton spacesuit helmet. “Fresh Seed”: The alarm went off — an unscheduled drop-off. Matteo slid out of bed, put on the heavy outdoor gear and a rebreather, and went up to the surface to unlock the vault’s door. “Time Travel Suicide Therapy”: “Can I help you?” Dax stood up and quickly covered the screen with his body. It was five minutes to closing time and he wasn’t interested in helping on yet another bored teenager, or house partner, or grandpa, or history student, or whatever to fulfill their sick time travel dream. He had his own problems, thank you very much. “Flight #008”: “Sir. Sir.” “What?” I am having a hard time opening my eyes. I always take a sleeping pill before getting on a plane. “In The Name of the People!”: “In the name of the People! Brighter! Bigger! More Brutal!” My director continued to urge me on. The video production for the horror story about devil worship and child sacrifice was already dripping with gore. I tried to stuff as much ghastliness as I could in every frame, but my boss wanted more. “Shifting Sands”: The wind howled northward, as normal for this time of the year. The angle of planetary spin resulted in a decreased amount of sunlight in the Northern Hemisphere during this portion of the orbit cycle. The atmosphere precipitated onto the surface as ammonia and water snow, lowering the air pressure, creating a stable gale south to north. “The Black Queen”: I’m a seed. Plant me. “The Boy Who Finds Time”: Timur has always been good finding things. Need to find that screw that rolled under the desk? Ask Timur. Need to locate the missing reading glasses? Timur is on it. Lost some change in a couch? Timur knows just where it is. The boy has a gift. “Toy Maker”: The cold creeped in like a thief in the night. “The Red Pen”: The package arrived battered and ripped. Exotic stamps covered so much of the brown paper exterior that it was hard to read the sender’s address. But David Gatewood’s address stood out just fine, as well as the “To Editor” addendum next to his name. Most requests for an editor came via email these days, but hey, work is work. “Life Light”: “Order! Order, Honorable Educators!” The lights and devices flashed again, as the power was cut and restored in rapid successions to bring the room back into a productive discussion mode. The screaming and arguing had gone on for at least two minutes now–unacceptable, life-light dimming behavior. “Another Wave of Refugees”: “Another wave of refugees is arriving,” the TV news announcer said in a grave voice. George Tiggleson, the news anchor for XWTZ Christian Voice of Americas, has been practicing this voice–deep, resonant, with a slight lamenting quality–for almost twenty years. This voice got him this job. “The Test”: It was beside me on the bed when I woke up–the little bag to pack my most cherished belongings before leaving to take the test. Our dorm has eight living in one great room and none of us heard anything in the night. No one ever does. This is the second time this week. The other bed is still empty. “The Perfect Gene”: “Line up right here. Right here, sir. Ma’am? Am I now being clear?” The SPA (Space Program Alliance) administrator, Dr. Tom English, pushed his way through a crowded hallway. Thousands turned up for the public call to recruit the new deep space program of astronauts. “Word Magic”: “But I hate that name!” The boy tried to squirrel away from his teacher. “The Soil of My Ancestors”: “Please sit down, Mr. Zhucov.” I indicated to the chair across from mine. Konstantin Konstantinovich Zhucov was referred to me by the New York City Rescue Mission. Mr. Zhocov has been one of their regulars, coming in for decades. Decades… Homelessness had never been an easy nut to crack. “Titan’s Spores”: “Take your hands off of me!” Lem backed away…floated away. He long ago learned to recognize when Janus was losing it. Two years, cooped up together in a small tin can would do that to any man…woman. Not that Min counted as a woman. “The Secret Order of Literaties”: The hospital library cart rolled into my grandmother’s room. I was told by my parents that she had a week at most. Why would one want to order more books just days before death? Why bother reading? So is it better to give perspective readers short plot summaries or the first few paragraphs or a story? I don’t know. It’s been almost a year since my last book came out, “Becoming Animals.” I’ve published a few short stories in the meantime, but my next two novels are just about to come out. 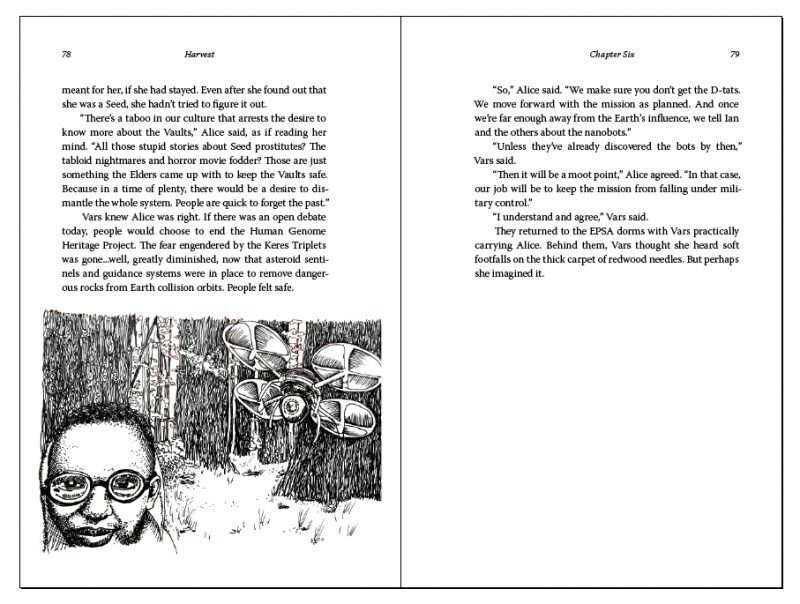 I’m done editing “Harvest” (the book previously known as “Gardeners” — thank you, Marina, for fixing the title!) and am working on illustrations. I should have it all together in a month or so. Below is a little preview from “Harvest.” I will send out the next newsletter with a link to a discounted version of the book. I will also make it available on KindleUnlimited for a time. 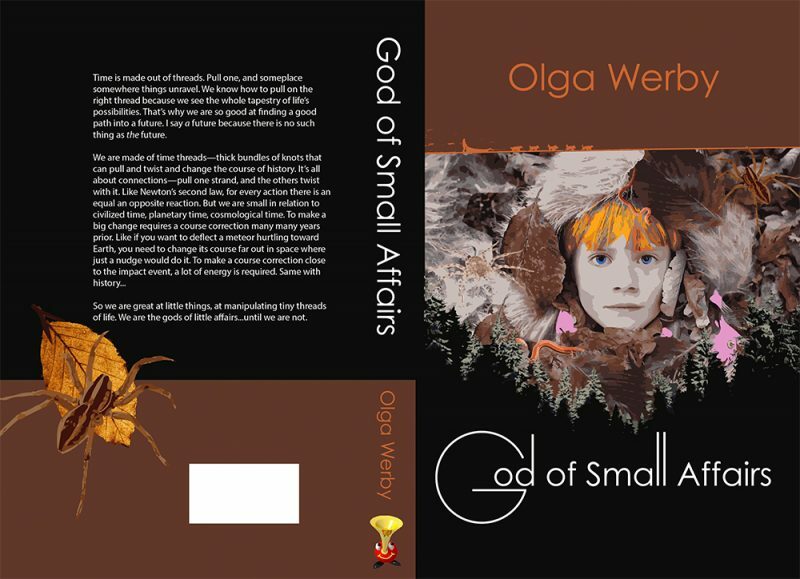 The second book, “God of Small Affairs,” is almost there as well. I have a draft of a cover, and the text is getting yet another pass (before another pass, and then another, and one final edit). With luck, that book will come out this summer, and then I can concentrate on my next story (I’m strangely uncertain if it is two novels or one). I assume that most of my readers have read most of my books, so I always like to include links to a few other free books (including a few of my own).